^ Dennis Overbye. Hubble Takes Snapshot of Jupiter’s ‘Black Eye’. 纽约时报. 2009-07-24 [2009-07-25]. ^ 2.0 2.1 2.2 Hubble Captures Rare Jupiter Collision. Hubblesite (STScI-2009-23). 2009-07-24 [2009-07-24]. ^ 3.0 3.1 3.2 Jupiter pummeled, leaving bruise the size of the Pacific Ocean. University of California, Berkeley press release, July 21, 2009. ^ 4.0 4.1 Jia-Rui C. Cook. Asteroids Ahoy! Jupiter Scar Likely from Rocky Body. News and Features @ NASA/JPL. January 26, 2011 [2011-01-26]. ^ Mackey, Robert. Amateur Finds New Earth-Sized Blot on Jupiter. The New York Times. July 21, 2009 [2009-07-21]. ^ Wesley, Anthony. Impact mark on Jupiter, 19th July 2009. (jupiter.samba.org). [2009-07-21]. （原始内容存档于2009-07-23）. ^ O'Loughlin, Toni and agencies. Amateur astronomer spots Earth-size scar on Jupiter. London: The Guardian. 2009-07-21 [2009-07-21]. ^ Martinez, Carolina. New NASA Images Indicate Object Hits Jupiter. Jet Propulsion Laboratory. July 20, 2009 [2009-07-21]. ^ Longo, Giuseppe. 18 (PDF). (编) Bobrowsky, Peter T.; Rickman, Hans. Comet/Asteroid Impacts and Human Society, An Interdisciplinary Approach. Berlin Heidelberg New York: Springer-Verlag. 2007: 303–330. ISBN 3-540-32709-6. . Accessed 2009-07-27. Archived 2009-07-29. ^ D. A. Crawford. Comet Shoemaker-Levy 9 Fragment Size (PDF). Lunar and Planetary Institute. [2009-07-22]. 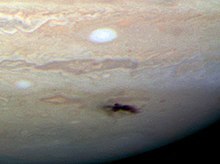 ^ Surprise Collision on Jupiter Captured by Gemini Telescope. Gemini Observatory. [2009-07-24]. ^ Grossman, Lisa. Jupiter sports new 'bruise' from impact. New Scientist. 2009-07-21 [2009-07-22]. ^ 17.0 17.1 17.2 17.3 Carl Hergenrother. More on the Jupiter Impact. 2009-07-21 [2009-07-24]. ^ Scott S. Sheppard. New Satellites of Jupiter Discovered in 2003. Carnegie Institution (Department of Terrestrial Magnetism). [2009-07-23]. ^ New moon of Jupiter found. SpaceFlight Now (University of Arizona News Release). [2009-07-23]. ^ 21.0 21.1 Bakich, Michael. Another impact on Jupiter. Astronomy Magazine online. 2010-06-04 [2010-06-04]. Hammel, H. B.; Clarke, J. T.; De Pater, I.; Fletcher, L. N.; Hueso, R.; Noll, K.; Orton, G. S.; Pérez-Hoyos, S.; 等. Jupiter After the 2009 Impact: Hubble Space Telescope Imaging of the Impact-generated Debris and its Temporal Evolution. Astrophysical Journal Letters. 2010, 715 (2): L150. Bibcode:2010ApJ...715L.150H. doi:10.1088/2041-8205/715/2/L150. 引文格式1维护：显式使用等标签 (link). Sánchez-Lavega, A.; Orton, G.; Hueso, R.; Perez-Hoyos, S.; Fletcher, L. N.; Yanamandra-Fisher, P.; Legarreta, J.; De Pater, I.; 等. The Impact of a Large Object on Jupiter in 2009 July. Astrophysical Journal Letters. 2010, 715 (2): L155. Bibcode:2010ApJ...715L.155S. doi:10.1088/2041-8205/715/2/L155. 引文格式1维护：显式使用等标签 (link). 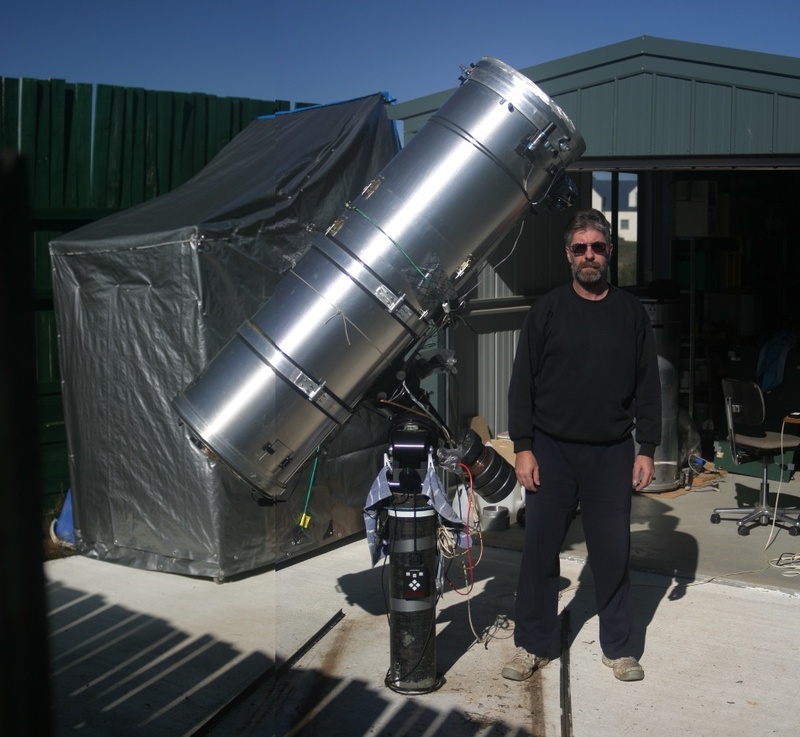 Photo of Anthony Wesley and his telescope. (jupiter.samba.org). [2009-07-21].